Not too many years ago I earned my living as a dollmaker and occasionally I still make and dress dolls but just for fun now. 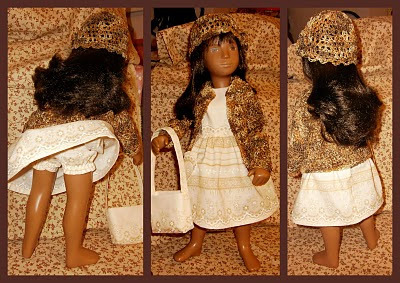 Sasha dolls are a delight to dress , not least because their realistic proportions. The dress material I used for this one have been lurking for ages and is just the right scale for her. The jacket and cloche hat are crocheted in a nobbly boucle yarn. Such a great idea! I did not roll my eyes at your post; I too have had trouble letting go of anything of Wee One's. The doll clothes you made are absolutely beautiful. Thanks for sharing.